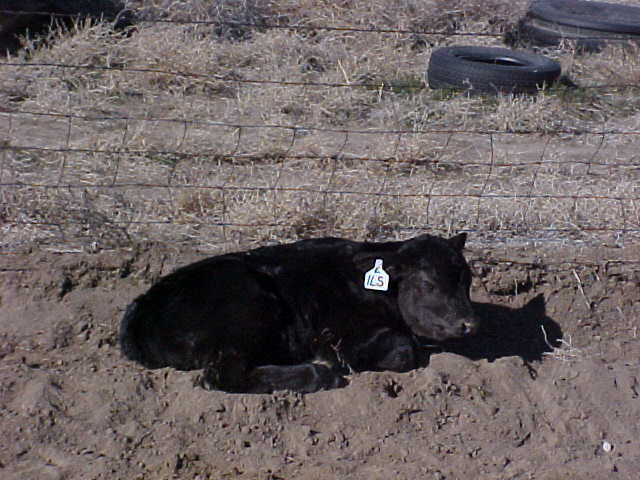 JENNE POWER LINE ANGUS is owned and operated by Thomas 'Skip' & Donna M. Jenne and their four children; Alexandria, Launa, Nikki and Talon. Their operation is based just west of Gering, Nebraska. JENNE POWER LINE ANGUS was established in 1994 when Skip purchased their first Angus cows from the Dave Taylor Dispersion. Skip has spent the majority of his life on a ranch, anywhere from Arizona to Alaska. It was in 1993 that the Registered Angus business drew his attention; it was then and there he decided that is what he needed to be doing. After spending most of his life on commercial cow/calf operations, Skip went to work for Dave Taylor Angus, managed by Gary Parker. A year of Angus 'Mentoring', as Skip calls it, resulted from that experience and he has since applied that knowledge to the production of the Power Line herd. After the Taylor dispersion, Skip worked for the Wilkes 6-D Angus ranch in Hawk Springs, Wyoming until 1999, whereupon he and his family moved themselves and their small herd of Angus cows to Elbert, Colorado, where they lived for the next two years. Between Gary Parker, Don and Doris Wilkes, Donna and I learned quite abit about what it was we needed to produce to make viable cattle in the Angus Business. Skip and Donna were married in June of 1996, both came with a ready made family. Currently, Skip is the Consultant for Vista Trend Gelbvieh, located southwest of Gering, Nebraska, and Donna works for the Panhandle Community Services office in Scottsbluff, Nebraska. Of the four children they have, two live with them fulltime; Nikki and Talon, and they attend Cedar Canyon School and are very active in school, sports and 4-H.
Our main goal here at POWER LINE ANGUS is to produce seedstock for either the commercial cow/calf operator or other seedstock producers, that are second to none. We want our customers to PROFIT from cattle that they purchase from us. If they don't profit we haven't done our job. We have seen what will work, and what won't. We have bred and put together a very ELITE bunch of mother cows that we feel are the top of the barrel in all respects. Our Cull program is very simple, 'If they don't work for us, they don't work for you'. Overall, our cows are all of moderate frame and stay in tip top condition year round..
We believe that our cattle are headed in the right direction; that direction being cattle, with completely balanced traits. It is our expressed opinon that cattle in this part of the country need to be of moderate size and stay fleshed up, no matter what the weather may throw at us, and the cattle, for the most part, need to be doing it on their own. Our grass situation over the last couple of years has proven to be very dismal, yet the quality of the GENETICS has kept our herd in top shape. Our cattle will, without a doubt, give you Predictability, Performance, Pedigree, Profitability, Practacality and Power. Feel free to stop and visit with us anytime, we look forward to seeing you. The coffee pot is ALWAYS on and we love to talk cows! !